After the success of Mon Oncle in 1958, Jacques Tati had become fed up with Monsieur Hulot, his signature comic creation. With international renown came a growing dissatisfaction with straightforward scenarios centered around one lovable, recognizable figure. So he slowly inched his way toward a new kind of film, a supremely democratic film that would be about “everybody.” His journey was a long one, ten years in all. At the end of the road, there was ignominy and bankruptcy. 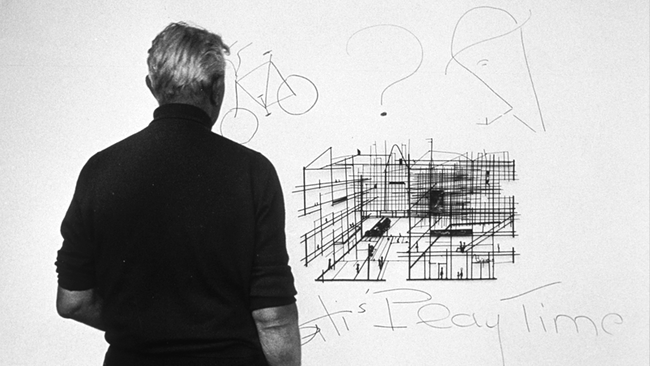 But Jacques Tati was secure in the knowledge that with Playtime, as his film about everybody came to be called, he had made a masterpiece. According to Tati biographer David Bellos, the contract for “Film Tati No. 4” was signed in 1959 with the provisional title Recréation. The intention was to mix film with live performance and create a space in which paying customers were not mere spectators but genuine participants. Like many artists before and after him (Abel Gance dreamt of stadium-sized audiences watching the stories of the world’s religious leaders on massive screens; Francis Ford Coppola hoped to project film on glass screens in specially constructed theaters), Tati wanted to break the formal bonds of his art form and create a new, totalizing form of spectacle (as Bellos notes, the dream was partly realized with the performances of Jour de Fête à l’Olympia in the winter of 1960/61). For his new film, Tati needed a set as vast as the streamlined public buildings and roadways that were soon to change the face of Paris forever. He needed to convey not just the texture of these new spaces but also their scope, in order to demonstrate exactly how they would house that most precious of all resources, human individuality. He elected to shoot his film in the costly 70mm format, with its magnificent widescreen clarity and depth. According to Bellos, Tati visited many factories and airports throughout Europe before his cinematographer Jean Badal came to the conclusion that he needed to build his own skyscraper. Which is exactly what he did. The massive set known as “Tativille” was built on land leased by the Parisian city council, in Saint-Meurice, at the southeast corner of the city. Stuart Klawans, in his brilliant book Film Follies: The Cinema out of Order, reckons that Tati’s Specta Films employed 100 construction workers to make two buildings out of 11,700 square feet of glass, 38,700 square feet of plastic, 31,500 square feet of timber, and 486,000 square feet of concrete. Tativille had its own power plant and approach road, and building number one had its own working escalator. A massive folly to be sure—though as Tati himself often pointed out, no more expensive than paying for the professional services of Sophia Loren. In the first of a seemingly endless series of disasters, a sizable chunk of Tativille was blown over by heavy winds, and had to be rebuilt to the tune of 1.4 million francs. Shooting began in April 1965, with a cast of non-professionals recruited by Tati’s new-found jack of all trades Marie-France Siegler, “starring” his neighbors’ former au pair Barbara Denneke. With July came unseasonable rains, with September the cash stopped flowing, and Tati had to do what many filmmakers spend the bulk of their time doing: beg for money. Nobert Terry, who acted as the film’s “product placement consultant,” put the director in touch with Prime Minister Georges Pompidou, who engineered a loan from Crédit Lyonnais. But in order to secure the loan, Tati basically had to mortgage away his future and that of his family as well. Meanwhile, the money just kept draining away. After 365 shooting days punctuated by long delays (due to everything from foul weather to the development of new gags to keep the film as up to the minute as possible), and after nine months of post-production, the newest creation by France’s comic genius premiered in December 1967, with the equivalent of an American “road show” presentation. Like Stanley Kubrick, Tati kept tinkering with the film after its premiere, eventually cutting it down to 120 minutes from its original 151-minute running time. Like Eyes Wide Shut, Playtime was the victim of a backlash, largely based on the outsized expectations surrounding this popular artist whose desire for publicity was equalled by his supposedly arrogant need for privacy during the (lengthy) act of creation. Moreover, despite critical appreciation, Playtime was so completely, alarmingly new in every way (plotless, starring not one or two people but a cast of hundreds, and completely dispensing with conventional notions of background and foreground) that it needed time to sink in with the public—time that it never got. Six months after its premiere, France was rocked by “the events of May ’68,” after which everything that came before seemed tainted and old hat. Despite Jacques Rivette’s observation that Playtime was “revolutionary in spite of Tati,” as well as Tati’s own comments that with Playtime he was on the barricades with the students in revolt, the film had become an artifact before its time. As 1968 drew to a close, Tati was completely bankrupt, and he had lost his house as well as the rights and the elements of his own films (he got back on his feet in 1977, five years before his death). To this day, the whereabouts of Playtime’s missing 31 minutes remain a mystery. Bellos assesses Playtime as “an expression of wonderment at humankind’s ability to create.” It seems fitting: this miraculous movie, still years ahead of its time, so heroically unwilling to distinguish between the functional and the frivolous, is itself a wholly wondrous creation.